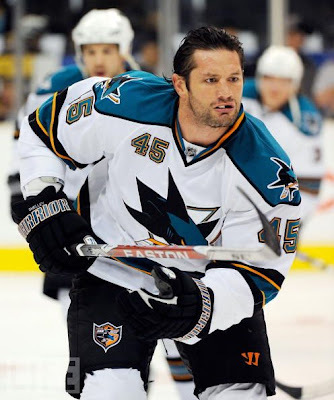 At the trade deadline of 3pm EST today in Brian Burkian fashion, Glen Sather announced the trade of Jody Shelley from the San Jose Sharks as our new fight-boy in Blue, one-goon out and another goon-in, in exchange for a sixth round pick. Here are his stats and here is the official announcement. No Horton or Booth on this lovely trade day, but when all else fails, appeal to the angry fan base by fisticuffs and fighting! With the Rangers on a downward slide, now having to win approximately 12-15 games of the next 23 in order to qualify for the playoffs, The Dark Ranger sees that management is doing everything possible to keep the audiences coming and cheering for a losing team. Not happy with the lack of action from the front office! Ugh... Just when I thought I couldn't find anothe reason to hate the front office. Jody Shelley is a tough SOB no, doubt... To bad hes a cheapshottin POS as well. He had no respect for the code... and Rangers fans everywhere had issue with this guy ever since the Richard Scott incident, where he jumped him from behind and broke his orbital bone. Nothing made me happier than the day Sandy Mccarthy schooled this punk and shut him out.